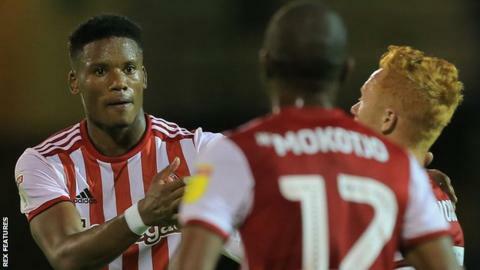 Julian Jeanvier scored the winning goal as Brentford beat Cheltenham to reach the third round of the Carabao Cup. French defender Jeanvier struck just before half-time, netting from close range following a goalmouth scramble. Championship side Brentford looked to stretch their lead and Lewis Macleod forced Cheltenham goalkeeper Scott Flinders into a fine save. League Two club Cheltenham's best chance fell to Aden Baldwin, whose header was cleared off the line. Second Half ends, Brentford 1, Cheltenham Town 0. Attempt missed. Said Benrahma (Brentford) right footed shot from the right side of the box is close, but misses to the right. Corner, Brentford. Conceded by Scott Flinders. Attempt saved. Chiedozie Ogbene (Brentford) left footed shot from the left side of the box is saved in the bottom right corner. Attempt saved. Said Benrahma (Brentford) right footed shot from outside the box is saved in the top centre of the goal. Corner, Brentford. Conceded by Johnny Mullins. Attempt blocked. Yoann Barbet (Brentford) left footed shot from outside the box is blocked. Corner, Brentford. Conceded by Josh Debayo. Substitution, Cheltenham Town. Liam McAlinden replaces Aden Baldwin. Attempt blocked. Chiedozie Ogbene (Brentford) right footed shot from outside the box is blocked. Attempt saved. Alan Judge (Brentford) left footed shot from outside the box is saved in the centre of the goal. Attempt saved. Alan Judge (Brentford) right footed shot from outside the box is saved in the bottom right corner. Sam Jones (Cheltenham Town) wins a free kick on the right wing. Attempt missed. Said Benrahma (Brentford) left footed shot from outside the box is close, but misses the top left corner. Foul by Josh Debayo (Cheltenham Town). Corner, Cheltenham Town. Conceded by Yoann Barbet. Attempt blocked. George Lloyd (Cheltenham Town) header from the centre of the box is blocked. Corner, Cheltenham Town. Conceded by Josh McEachran. Attempt missed. Lewis MacLeod (Brentford) right footed shot from the centre of the box is high and wide to the right. Attempt missed. Said Benrahma (Brentford) right footed shot from a difficult angle on the right is close, but misses to the right. Attempt missed. Yoann Barbet (Brentford) left footed shot from the centre of the box is just a bit too high following a corner. Substitution, Brentford. Chiedozie Ogbene replaces Marcus Forss. Attempt saved. Said Benrahma (Brentford) right footed shot from outside the box is saved in the top left corner. Johnny Mullins (Cheltenham Town) is shown the yellow card for a bad foul. Marcus Forss (Brentford) wins a free kick in the defensive half. Hand ball by Yoann Barbet (Brentford). Lewis MacLeod (Brentford) wins a free kick in the attacking half. Attempt saved. Said Benrahma (Brentford) right footed shot from a difficult angle on the right is saved in the centre of the goal. Substitution, Cheltenham Town. Alex Addai replaces Immanuelson Duku. Attempt blocked. Sam Jones (Cheltenham Town) left footed shot from the centre of the box is blocked.